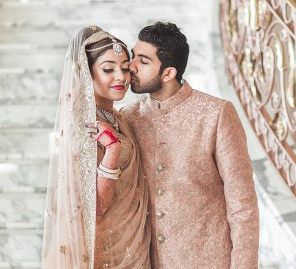 Anjali and Kyle’s beautiful union was an extravagant celebration of their love meticulously planned by the couple themselves. 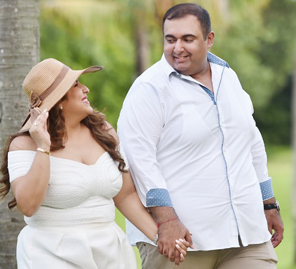 Anjali and Kyle pulled off a lavish Indian wedding in the beautiful environs of Hilton Garden Inn Gurgaon. Have a look at the lovely wedding they managed to plan themselves and how they traded wedding traditions to the merriment of all. 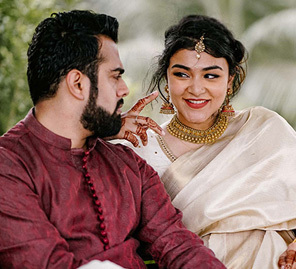 “I always wanted to wear a wine colored lehenga with beautiful green jewellery for my wedding and so that’s what I did,” Anjali smiles. The wedding was captured by The Wow weddings and the bride and groom both loved the personal touch to the photographs. It was a first for Kyle’s family and the traditional Hindu ceremony was wonderful to witness. The fun traditions were also extra exciting, “While stealing shoes, it was more like a game of Rugby than just a tradition which was taken pretty seriously as all his friends and my cousins left the wedding venue and went on the main road to chase for these shoes,” Anjali says, laughing at the memory, “It was a great experience for Kyle's friends and family to see various rituals and participate as well.